Today was a milestone day – my eldest son starting school. No hiding from the fact that he is growing up and entering into worlds I cannot follow. Already a bundle of emotions I find hard to fathom. Energy, frustration, eagerness, imagination, wildness, joy and longing bundled tightly into a body too small to handle the range. Coiled. This beautiful baby of mine, growing up and away. Yesterday, I held him helpless in my arms. Tonight, I watch him sleep. His still full cheek, the deep breath of sleep, there are echoes of the baby. He will wake tomorrow morning, full of boundless energy and enthusiasm. Impatient to live every moment. And in that bounce, is the boy. He will tell me things that he has learned. He will unknowingly utter wise things and I will see the promise of the man. He is on the cusp of a new chapter. Entering into realms that I can still remember of my own childhood. Not just vague and dream like snippets – but years and events I can recall with clarity. I am no longer a “new” mum. My little one is getting older and I with him. There is such promise ahead but I look back with a tinge of sadness. I will no longer be his world. There will come a time when I occupy just a small part of it. But he will always have my whole heart. I get to watch him grow. Watch him discover passions. Watch him succeed. Watch him struggle. Be there when he soars as he falls in love and there to catch him if he falls. And this day feels like the beginning of all of that. 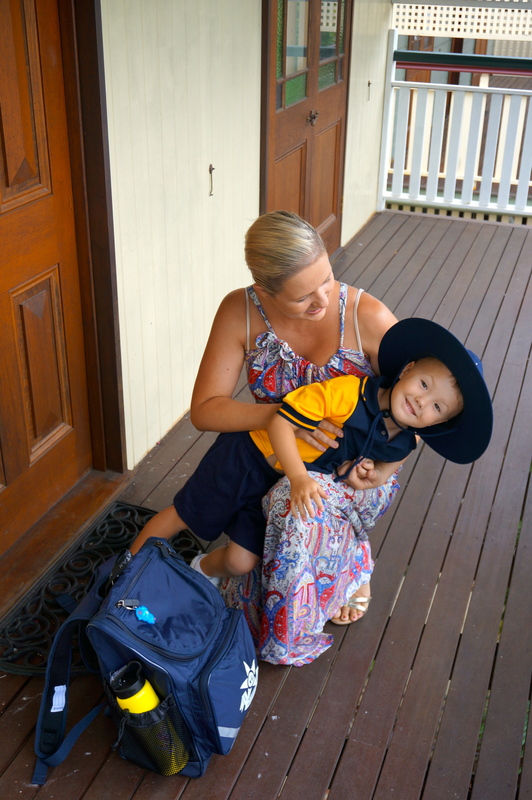 So many mums this week will be feeling similarly as they bravely hug their boys’ and girls’ goodbye and leave the school gates feeling a little empty. And then there are those whose arms have been empty for a long time. And for whom the fresh new school year heralds a new ache. Those that should have been sending their little ones into the school yard for the first time but instead feel a new pang. For their little ones, frozen in time. Forever tiny. Wishing their tears were falling because their child was growing up. Today, I was brave and did not cry. Tears threatened but I beat them back for my son. But on the day Xavier would have started school, I will not have to fein bravery for the sake of him. And the tears will fall for a milestone that never was. So as my eldest lets go of my hand and flies, I will forever strive to be the stable bow.